Pigmentvoll, groß, gehaltvoll, kräftig, trocken, fest sehr gutes höhen-längenverhältnis, sehr gute ober-und unterlinie, sehr guter typ und Ausdruck, kräftiger kopf, sehr guter stirnansatz. Hoher, langer Widerrist, sehr gute lage und Länge der Kruppe, sehr gute Vorhandwinkelungen, sehr gute lage und länge des schulterblattes, sehr gute hinterhandwinkelungen, kräftie keulen, feste Sprunggelenke, ausgeglichene Brustverhältnisse, absolut gerade Front und Schrittfolge, raumgreifende, flüssige, sehr dynamische Gänge, kraftvoller Nachschub und freier Vortritt. Sicheres Wesen, TSB ausgeprägt, läßt ab. V. Pigmentvoller, anatomisch korrekt aufgebauter Rüde mit sehr gutem Gepräge. VI. Geeignet zur verbesserung der Anatomie, der Pigmentierung, der Ganganlagen und des Typs und Ausdrucks. looking for a semi adult male from omen or a large size show prospect female who can be mated to omen . We have his son for sale if anyone is interested. I am interested in finding a well bred and reasonably priced male puppy or young male by Omen v Radhaus. Super male. If you want a puppy from him bred to a top V female please let me know ASAP. Omen e' un degno erede di Remo. Erede al trono !! Notably fantastic Male Stallion. 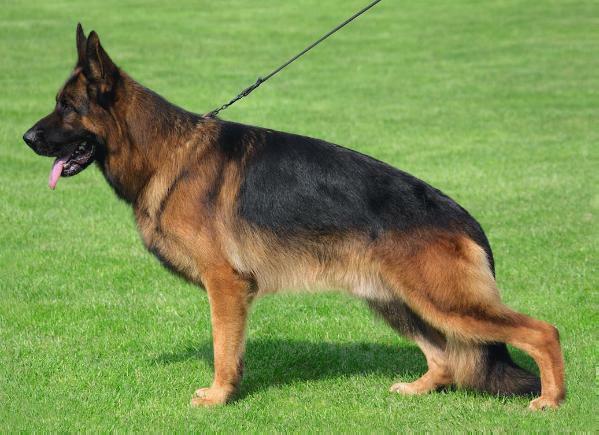 A quick review of all the other many beautiful GSDs bred by Radhaus Kennels explains how deep the quality runs at their kennel. These folks understand what the best conformation is, what real curbside appeal consists of. Take Beauty Radhaus, a fantastic female in her own right. And there have been many more of that top quality and beauty. These folks do not compromise temperament either and are producing top GSDs. Congratulations to Radhaus for such a great GSD such a VA Omen who will leave a huge mark on the breed and probably will go Sieger. Definetely future VA 1 ! I see good breeding with progeny of Omen X progeny of Arex. Better anatomy than his father ,same level with Vegas! Many people say Omen is the would-be sieger in 2013. Does anyone know who owns him and where he stays? An outstanding male, absolutely correct size, excellent type and conformations. His character is also excellent, with SchH protection scores of 91, 94 & 94. His breeding is also outstanding through Sieger & VA Remo and his top producing female lines which include twice Sieger and top producer Vegas and Ulli von Aurelius a VA Nero daughter who produced VA Arex. Omen was SG2 at the 2010 Sieger when just over 12 months old with his brother Opus in SG8 position. I expect great progeny from this male and continuing success in the show ring. I have already mated one of my best females to him. HERE YOU CAN FOUND EMAIL ADDRESS. Can anyone give me a telephone number or email address, and let me know where is the dog? Excellent male like his father.many congratulations to the breeder and the whole team who did a lots of audacious work for showing that dog. very good show results omen !!! GREAT DOG SHOULD BREED GREAT. Congratulations to his breeder not only for Omen's placing but for this whole wonderful litter. Omen and Opus both were looking great. personally I felt Opus might have more chances for SG6 or SG5 places.